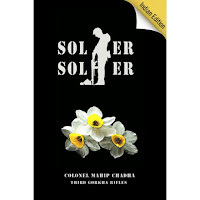 As I am very particular about English spellings and pronunciations, my eyes ran accidently on the book titled ‘Soljer Soljer’ written by Colonel Mahip Singh Chadha. I was in my usual pet library scanning for the new books on the bookshelf. My eyes halted on this book title and I couldn’t digest myself. I thought about my daughters. Then suddenly something struck me. I immediately came home and consulted my dictionary. I discovered that according to the pronunciation key notes, the word ‘soldier’ has the letters ‘d’ and ‘i’ that are silent and instead ‘j’ is used when we pronounce the word. The author must have taken this annotation while giving the book title. Yes, I too sometimes refer the pronunciation notations while teaching the origins and spellings of English words to my daughters. However, after reading the book I found the story, plot, and the theme in particular quite different as well as interesting from the usual book. As I opened the book to read I found two reviews already. This was certainly some unusual way to present the book. Fine! Then, there were no such dialogues; I mean some spicy and hot conversations between various characters. Instead I found some Hindi and Punjabi proses in italics and their translations in English just after them. Yes, the author may have planned for the worldwide audience before writing this book. I was quite amused with this finding, a secret may be. This book is the author’s second book that is purely narration-based. And yes, there were indeed some dialogues in italicized and narrative format. Though the story theme is based on the fictional infantry battalion of the Third Gorkha Rifles, the Sixth Battalion, I liked the way the author has given some minute real-life accounts about the infantry life and activities in general. I take pride that through this book the author has emphasized about the emotions and relationships among family members and friends. Though the story encircled the main protagonist, Brigadier Surinder Singh Sahni and his family, I found many accustomed Indian food and cultural habits and attitudes among the major characters. Even after so many frowns initially, I can say that the book is worth reading. I just wonder about the author’s other two books. His first book, ‘Grit Guts and Gallantry’ seems to be a story of some legendary hero or soldier by its title. But, this is not so. The story synopsis is actually about the real-time preparation guide meant for those young applicants who really aspire to apply to the army. The author’s third book titled, ‘Gin and Lime, Whiskey or Wine?’ is another one that makes me wonder about its title. The book title seems to me to be a story of a drunkard protagonist and the title also rhymes like some children’s poem does. 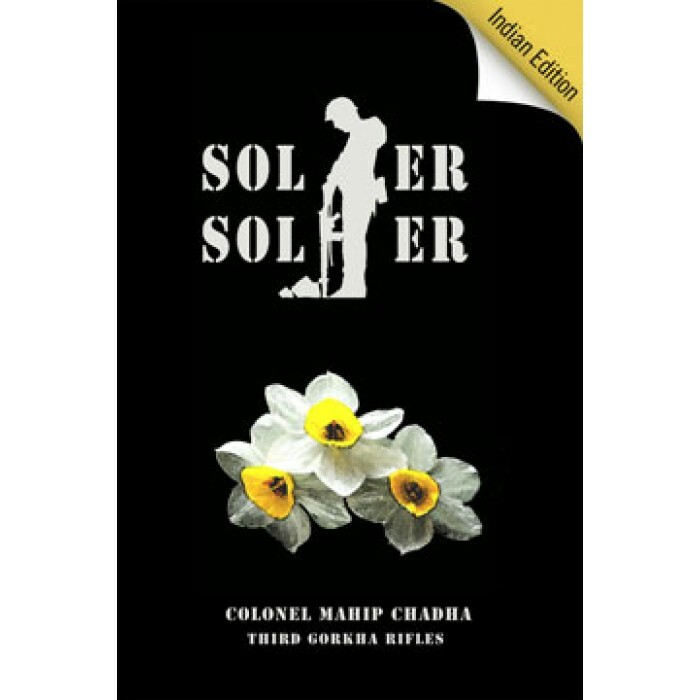 Surprisingly, the book is about the life story of old age and retired army officers and soldiers. Really, I am looking forward to reading these two books in the coming months. 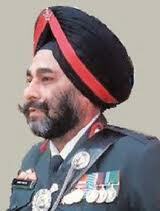 Colonel Mahip Singh Chadha is an alumnus of the National Defense Academy, Kharakvasla, Pune. He was commissioned into the Second Battalion, the Third Gorkha Rifles (popularly known as the VC Paltan) and also served in the Third Battalion, before retiring in June 2000. After the retirement, he worked in many fields and was the President of Helios Aviation, Delhi, which he raised from scratch. He has now started writing, in the hope that his reminiscences will inspire youngsters to serve the country, just as he did. He resides in New Delhi and started writing as a profession in 2009. He has written three books till date. They are: Grit Guts and Gallantry, Soljer Soljer, and Gin and Lime, Whiskey or Wine? I wish to thank The author of this review -Ms Srivastava for an excellent write up-I wish she had included some actual incidents from the book! I also wish to thank Ms Shreya Chatterji for publishing my book. The reference to my other books is also very appropriate though one of them Grit Guts and Gallantry is sold out!